As I have said before, we have had an abandoned puppy living with us. At nine months, he is the sweetest, calmest dog I have ever seen. A little too calm for this busy household. He didn’t mesh as well with the other two as we had hoped either. It seemed like he was afraid of them. So sadly he had to go to the SPCA. They called the place where he got his rabies shot and they were able to track down the owner. He lied and said the puppy had been sold, but before we could even leave, they had found a good home for jerry/gamble. It was a tiny bit of a relief. He’s with a good family, and not always on our laps anymore. I thought that’s where this story would end. But nope! They had some lab/cattle dog puppies that my BIL couldn’t resist. So we ended up with a new Gamble. This one is much more suited for Bil and he has somethign to accupy this time. He’s as cute as can be with his little white paw. Hubby has been talking about getting Baby blue a puppy for his birthday. One that belongs to him and him alone. I haven’t been so sure about it, but we’ve already got one puppy in the house. I am NOT going to train one puppy, only to have to train another. I called the SPCA to find out if Gamble’s brother was still there. Even though they are closed on Sundays they called and said if I’d like to pick him up they would be willing to open for us. So Baby Blue has his puppy. 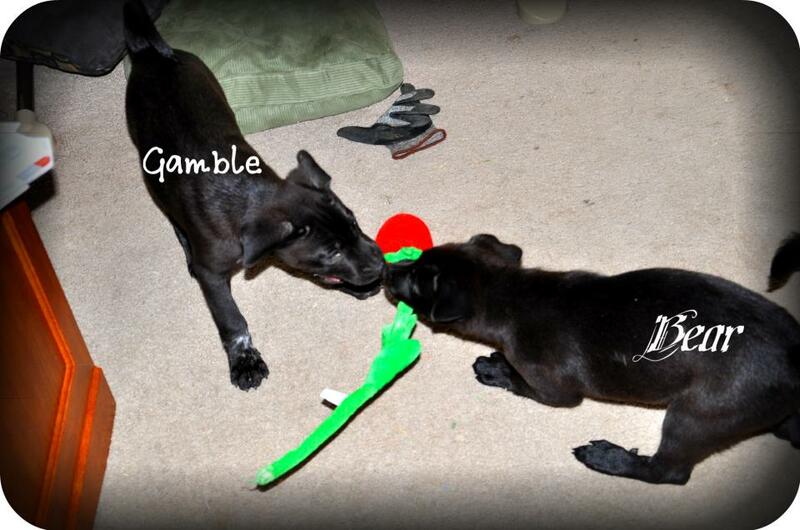 We thought it wouldn’t exactly be appropriate for our baby boy to have a dog with a gambling name. Instead of continuing with our casino names, we decided that this little boy would be named Bear. He will get almost as big as Blackjack, so Bear seems to be an appropriate name. Especially since we get told all the time that we don’t have dogs, we have mini bears. Thank goodness I only have to go through puppy training once more…. just think, by the time I’m done it will be little boy potty training. Man I have my work cut out for me. Posted in Baby, boys, brother in law, dogs, family, hubby, humor, husband, life, Life Lessons, military, military family, milspouse, mommy, navy, Parenting, pets, photography, Uncategorized, wife and tagged babies, baby, baby boy, birthday, boys, brother in law, change, child, children, dogs, family, hubby, husband, kids, life, milhubby, military, military baby, military family, military life, military wife, milspouse, mommy, parents, pets, Pets are kids too, photo, photography, puppies, son, spouse, wife. Bookmark the permalink.